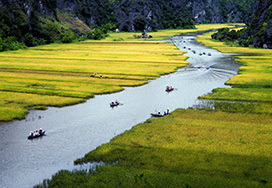 This mountain bike trip will take you to some of the most scenic areas in Northern Vietnam. Travelling through stunning mountainous landscape to the highest stretch of road in Vietnam, called Heavens Gate. 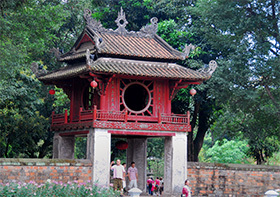 You will cycle downhill to Tam Duong passing through Binh Lu. Along the way, you will pass by picturesque villages and rice paddy fields of breathtaking beauty - you are sure to need more than one photo stop on this journey. You first travel by car uphill toward Tram Ton. On the way, you can take a short walk to Silver Waterfall and then head to Heaven Gate, where you will be amazed by breathtaking view to mountain surrounding included Fansipan, the highest peak of Indochina. Your ride will be mostly downhill toward Binh Lu. You will stop by Chu Va village of Black Hmong for a break before you arrive in Binh Lu. Here you will have lunch in a local restaurant. After lunch, you start to cycle mostly uphill for the rest of today, which requires incredible effort. You will be able to stop by a village You will then probably need the help of the supply car to go up another high pass, before enjoying the easy ride downhill all the way to Tam Duong, where you stay overnight in a hotel. 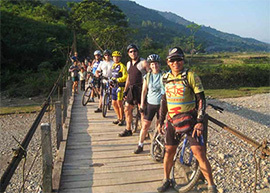 You will start out from Tam Duong by cycling uphill along picturesque tributary of the Na River. You will see some places of gold exploration along the river. You also pass by many villages of Thai minority spreading along the way before reaching to Pa So. You stop for lunch in a local restaurant. You will then continue the ride on a flat road toward Sino – Vietnamese border. You will enjoy a beautiful ride along river. You head back to Paso later to spend the night in a hotel, which locates by the river. You will be able to enjoy a cold beer on the balcony with beautiful river view. Today’s ride will be mostly downhill. You will have time to enjoy beautiful scenery as well as stop by a village of Thai minority, the largest group ethnic in this area. You still follow the road, which goes along the Na River until you arrive in Lai Chau in the early afternoon. You check in a hotel and have a late lunch. 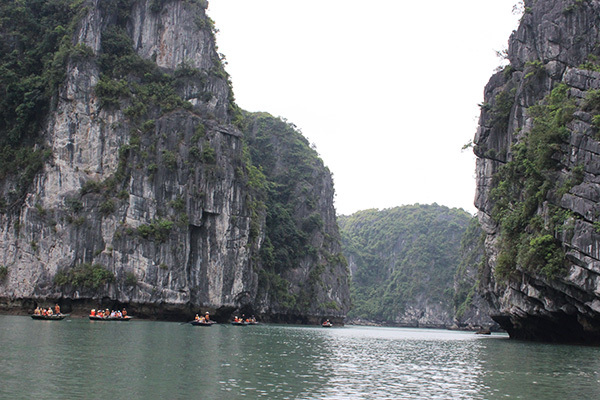 After having a rest, you will be transferred to the river, where you take a boat ride downstream in the Black River. You can make a stop to visit a village of Thai minority and hear about their daily life on the riverbank. A friendly atmosphere makes your trip more enjoyable. The boat takes you further downstream. You will be transferred back to the hotel in the late afternoon. Today will be a longest ride. You will start out on a good road, which makes your ride very comfortable. You arrive in Muong Lay by noon. Here you will be able to take a walk around a local market. You will have either lunch in a local restaurant or picnic lunch prepared by the hotel. After lunch, you head toward Dien Bien Phu. You will continue on the good road and the ride is even more enjoyable in a beautiful nature. The ride will be downhill and then flat upon your arrival in Dien Bien Phu. Mountains and huge rice fields surround the busy town. Here you spend the night in a hotel. You will be able to take a walk to a nearby market to stretch your legs. 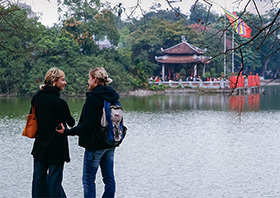 After having breakfast, you will have an interesting bicycle trip around the town to visit famous historical sites such as Dien Bien Phu Museum, Glory Statue, A1 Hill and De Cattery Tunnel. You will be back to the hotel for lunch. 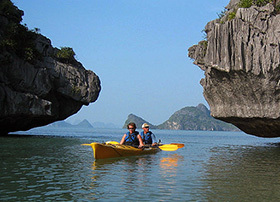 In the afternoon, you will be transferred to the airport for a flight to Ha Noi.